This volume covers the history of printing and publishing from the lapse of government licensing of printed works in 1695 to the development of publishing as a specialist commercial undertaking and the industrialization of book production around 1830. During this period, literacy rose and the world of print became an integral part of everyday life, a phenomenon that had profound effects on politics and commerce, on literature and cultural identity, on education and the dissemination of practical knowledge. 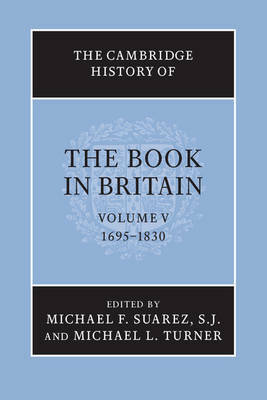 Written by a distinguished international team of experts, this study examines print culture from all angles: readers and authors, publishers and booksellers; books, newspapers and periodicals; social places and networks for reading; new genres (children's books, the novel); the growth of specialist markets; and British book exports, especially to the colonies. Interdisciplinary in its perspective, this book will be an important scholarly resource for many years to come.